Bain- Marie lid included, Historia Decor colletion by Ruffoni. Used because it eliminates lumps. The most delicate sauces need to be cooked slowly and gently and therefore at the temperature of boiling water (maximum 100°C). These splendid creations have the dignity of a unique piece,worthy of a place on the table. 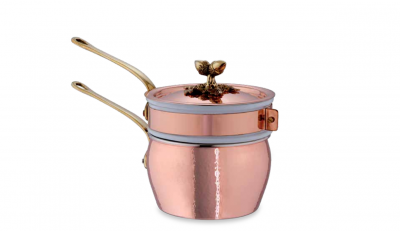 These copper items are the most significant expression of the extraordinary technical and artistic ability of our master coppersmiths and with them we re -live centures of history,experiences and traditions. Suggeted for cooking on the gas stove or in the oven, they are manufactured in solid copper of 1.0 to 1.5mm.,thickness. Hammered and tin lined by hand they have cast polished brass handles and finishing.